AvMA is pleased to name leading patient safety campaigner James Titcombe OBE as the new Associate Editor of the Journal of Patient Safety and Risk Management. 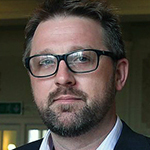 A former project manager in the nuclear industry, James became a leading figure in the Morecambe Bay Investigation following the death of his son Joshua due to failures in his care at Morecambe Bay Trust in 2008. He is a former National Advisor on Safety for the Care Quality Commission, a founder of Patient Safety Learning and speaks and writes regularly about patient safety. James is also a patron of AvMA. The Journal of Patient Safety and Risk Management (JPSRM) is an international journal considering patient safety and risk at all levels of the healthcare system, starting with the patient and including practitioners, managers, organisations and policy makers. It publishes peer-reviewed research papers on topics including innovative ideas and interventions, strategies and policies for improving safety in healthcare, commentaries on patient safety issues and articles on current medico-legal issues and recently settled clinical negligence cases from around the world. The Editor in Chief is Professor Albert Wu MD, Faculty Director of the Bloomberg School of Public Health at John Hopkins University, USA. The Journal of Patient Safety and Risk Management is published bi-monthly by Sage Publications.